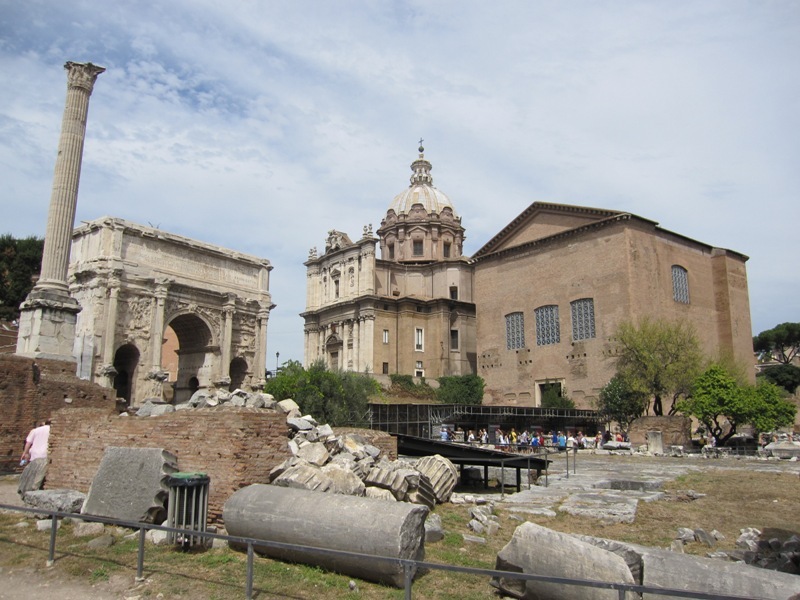 The Senate House on the Forum Romanum. ‘Filibustering’ refers to politicians holding endless speeches in parliament, touching upon all sorts of issues that are more or less off topic. The sole intention is to prevent the debate from being closed so that a vote can be called. As far as I know, we find the oldest known examples of filibusters in ancient Rome. This essay is about filibusters in the Roman Senate during the (late) Republican period. The Senate was the most important advisory body in Republican Rome. Unlike the other Republican institutions, the Senate had a certain permanent nature. Rome’s elected magistrates usually held their offices for just one year and the popular assemblies could only meet when convened by a magistrate. This was only possible on certain days, the dies fasti et comitiales, and required following complicated procedures, but a meeting of the Senate was easily arranged. The Senate could come together on virtually every day of the week, even on so-called dies nefasti (‘forbidden days’). Furthermore, senators were not elected. They were appointed by the censors, normally for life, although in case of misbehaviour the censors could eject members from the Senate. This was not uncommon during the late Republic: in 70 BCE no less than 64 of the 600 senators – over 10 percent – were struck from the senatorial list. Still, expelling senators from the Senate was the exception and serving for life the rule. The short terms of office of the magistrates combined with the impermanent and massive nature of the popular assemblies (every adult male citizen had the right to vote) made the Senate a very powerful player in the ever expanding Roman Republic. If it was inconvenient to give certain duties to the other institutions, they were usually swiftly attributed to the Senate, either formally or informally. In the absence of a written constitution or a statute enumerating the Senate’s competences, it soon became difficult to differentiate between the Senate’s de iure powers and its de facto powers. Clearly the Senate possessed lots of power and authority. Moreover, the senators had all the time in the world for their political activities, since members of Rome’s nobility did not work for a living. Senators simply lived off the fat of their lands and could fully dedicate their time to the res publica. As explained above, the Senate could in principle meet on every day of the week. A Senate session lasted from sunrise until sunset. It was possible to start later, but it was not allowed to continue after sunset. If the Senate wanted to take a decision – a senatus consultum – the session had to be closed before sunset. Senators could delay the vote by using the filibuster instrument. There were no restrictions on speaking time and even the simplest pedarius or backbencher had the right to speak as long as he wanted. The Latin term for filibustering is diem consumere, which literally means ‘consuming the day’. Judging by the ancient sources, it seems the senators only became aware of the possibilities offered by this instrument in the late Republic. Perhaps they were held in check by senatorial customs and gentlemen’s agreements before that time: it may have simply been ‘not done’ to obstruct Senate procedures. Examples of Roman politicians who have used this instrument are the tribune and demagogue Publius Clodius Pulcher and the famous senator Marcus Porcius Cato. Cato’s use of the filibuster is especially interesting, as it clearly demonstrates that other politicians were powerless against a colleague who wanted to ‘consume the entire day’. Even in his own time, Marcus Porcius Cato the Younger was known for his soberness (although he was a heavy drinker), his incorruptibility, his straightforwardness and his arch-conservative opinions about the essence of the Roman Republic. Cato loathed reformist politicians like Gaius Julius Caesar. He believed, with some justification, that their plans for agrarian reforms – redistributing public land and granting it to poor Romans – were politically motivated and merely intended to raise the reformers’ popularity among the people. Bust of Caesar (Rijksmuseum van Oudheden, Leiden). 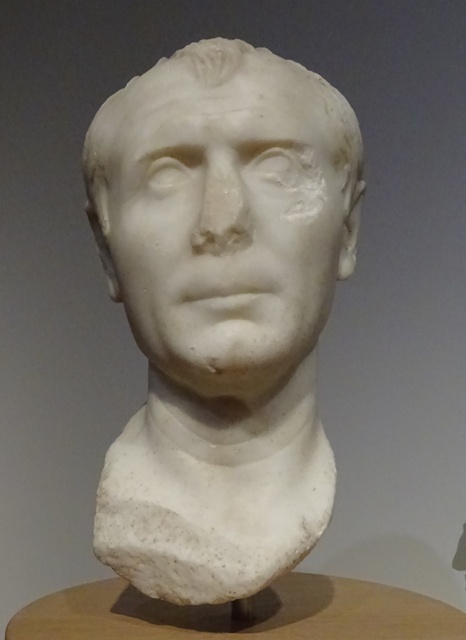 In January of 59 BCE, the year in which he was consul, Caesar defended his proposal for a lex agraria in the Senate. Cato was his most vocal opponent. At first, everything seemed to be going smoothly for Caesar. The highest magistrates and former magistrates held their speeches without offering too much resistance to Caesar’s bill. But then it was Cato’s turn to speak. Cato had only been quaestor, the lowest magistracy of the cursus honorum, and people’s tribune, but he managed to have the vote on Caesar agrarian bill postponed by speaking endlessly about all sorts of topics. There were certainly informal means to persuade a senator to end his speech: booing, hissing and other signs and sounds of disapproval were quite common. The doors of the Senate House were always open during the deliberations, so verbal interventions from the people outside were also possible. However, there was only one formal way to cut off a speaker: the presiding magistrate – in this case the consul, i.e. Caesar – had to physically remove him from the Senate building. Using his imperium, that was exactly what Caesar did. Even though it was perfectly legal, Caesar’s action was controversial and unpopular with a large part of the other senators. According to tradition, one of them left the Senate House, proclaiming that he would rather be in prison with Cato than in the Senate building with Caesar. Cato could now play the victim of a tyrant and Caesar suffered a humiliating defeat: the Senate did not take a decision on his bill. 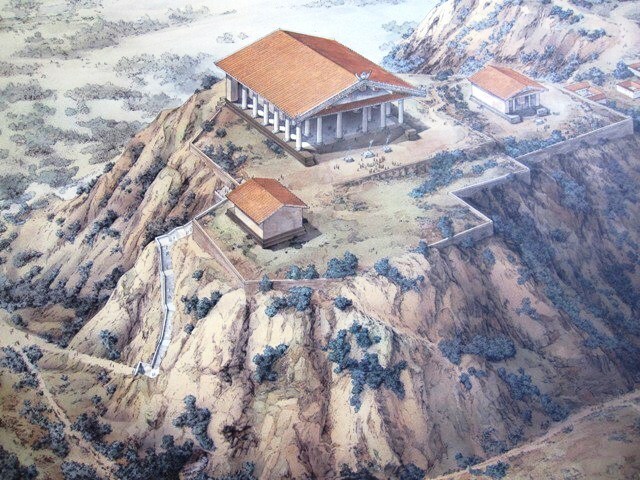 Even though it must have been very frustrating for magistrates like Caesar that the Senate could not call a vote because of senators like Cato, we must remind ourselves that there were marked differences with regard to duties and powers between the Roman Senate and – for instance – the present-day Senate of the United States. The American Senate is part of the legislative power and can actually reject bills, whereas in Republican Rome, bills were adopted by the popular assemblies. 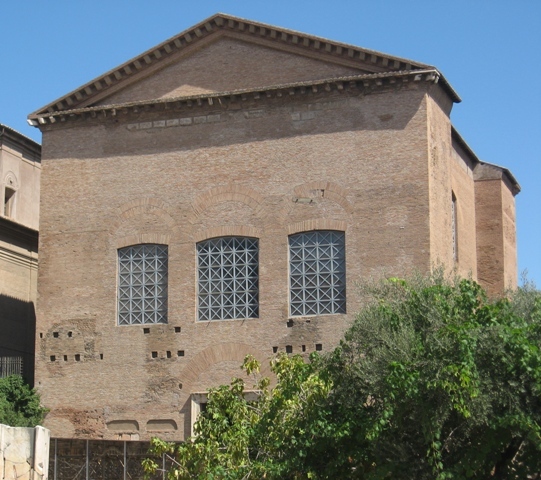 The Roman Senate was an advisory body, and although its advice concerning bills was very authoritative, it was ultimately up to the sovereign people of Rome to decide whether or not to adopt a legislative proposal drafted by a Roman magistrate. Cato’s filibuster did not prevent Caesar from presenting his land bill to the popular assembly, where it was carried by a large majority. This did not happen without a fight, literally: just before the vote, Caesar’s fellow consul (and political opponent) Bibulus was humiliated when someone emptied a bucket of dung over his head. Gnaeus Pompeius (Museo Archeologico Nazionale di Venezia). We find other examples of filibusters by Cato in the sixties BCE. In 62 BCE, the proconsul Pompeius, who was in Asia Minor, sent a request to the Senate to postpone the consular elections for 61. He wanted to be in Rome in person to support his ally Piso, who was a candidate for the consulship. The power to move the elections to a later date lay with the acting consuls, more specifically with the consul who would preside over these elections. Such a magistrate would never take a decision as far-reaching as postponing an election without consulting the most important advisory body in ancient Rome: the Senate. Cato prevented the Senate from giving its advice by filibustering, and thus also prevented the elections from being moved to a later date. Clearly the presiding consul did not want to take a decision without the backing of the Senate. It did not matter much for Piso, as he won the consulship anyway, even without Pompeius being present. In 60 BCE, Cato won a significant victory over Caesar, a victory which would cause the already problematic relationship between the two adversaries to deteriorate even further. In the previous year, Caesar had been propraetor in one of the Spanish provinces. He had won a few victories over the Spanish tribes, had been hailed imperator (‘victorious general’) by his men and could for that reason claim a triumph once back in Rome. A triumph was the highest honour a Roman general could reach: on the day of the triumphus, riding in his chariot, dressed as the supreme god Jupiter Optimus Maximus with his face painted red, he was very close to being a god himself. The Temple of Jupiter Optimus Maximus on the Capitoline Hill (Capitoline Museums, Rome). Caesar had a problem though. He also wanted to be a candidate for next year’s consulship. The law required him to stand for election on the Forum in person, but that meant Caesar had to cross the symbolic sacred border of the city of Rome, the pomerium. The imperium of generals who crossed the pomerium lapsed automatically, and that meant they could no longer lead their troops during a triumph. Which meant the triumph itself was off as well. There was just one solution: a candidate could stand in absentia. For this he needed dispensation from one of the acting consuls, but again it is clear such a consul would not grant it without support from the Senate. With an endless speech, Cato prevented the Senate from reaching conclusions. Caesar then chose the consulship over a triumph and crossed the pomerium. One year later, when Caesar was consul, he clashed with Cato again, which has been discussed above. Even though in Roman politics it was seldom possible to formally block decisions, a filibuster remained a powerful political weapon in the hands of a skilled orator. It seems to have been used more and more as the Republic began to collapse, but in the Imperial age it did not play a significant role anymore. Although during the reigns of the first emperors the Senate still possessed some authority, it later became an institution that simply rubberstamped decisions that had been prepared in advance. Andrew Lintott, The Constitution of the Roman Republic.